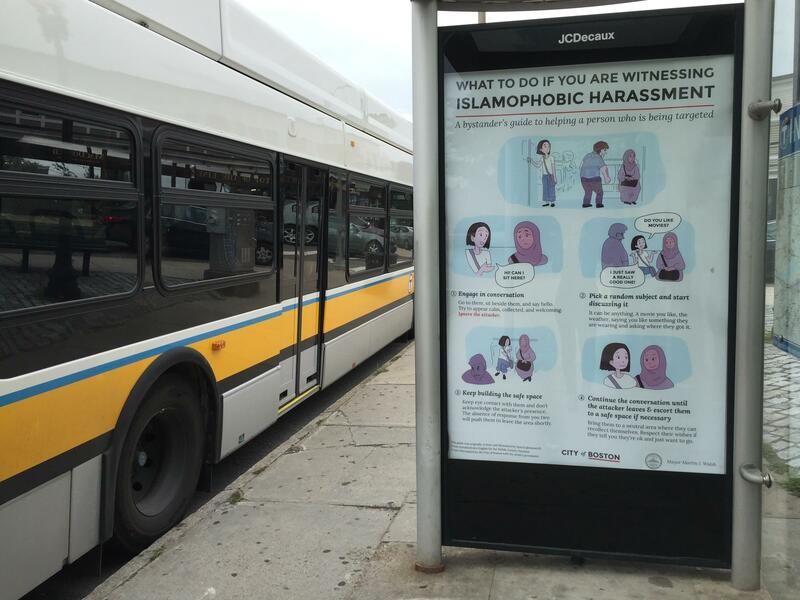 New signs in Boston encourage bystanders to intervene if they see Muslims being harassed. A group of kids recently uttered slurs at Robert Powell after he stood up for a Muslim boy on a bus. Signs are everywhere these days urging Americans "If you see something, say something." Now, in Boston, new posters are going up that urge residents to go a step further and intervene if they see Islamophobic harassment. From a distance, it looks like a cute cartoon, until you read the bold black headline – "What to do if you are witnessing Islamophobic harassment." Below is a giant comic strip showing a young woman watching as a burly guy grimaces at a woman in a long dress and hijab. "It is a sign of really frightening times," says 59-year-old Diane Shufro, who did a double take as she passed one of the posters on the side of a bus stop in Boston. But she says she's heartened to see city officials encouraging people to be involved. "I hope it gets people thinking," she says. Step one, the poster implores: "Ignore the attacker." In other words, don't even make eye contact. Instead, the poster instructs, start talking to the person being attacked — about anything. "You can say something about you like the shoes that someone is wearing or you know, asking them about the weather or things like that," says Faisa Sharif, a mayor's liaison in Boston's Neighborhood Services Office within the Civic Engagement Cabinet. The goal, she says, is to break the tension, and to show residents that even the simple friendly gesture of striking up a casual conversation with a person who is being harassed, will often get an aggressor to back off. "This whole campaign is about de-escalation in terms of helping resolve a situation like this," says Sharif. "Especially in the age that we live in when we see a different sort of national rhetoric targeted toward certain groups." Sharif says the posters were designed in France after the terror attacks in 2015, and then went up in San Francisco. A Boston resident suggested the posters be brought here. On a recent afternoon in Boston, the message was already getting through to passersby. "Oh! I see what they mean now," said 31-year-old Boston resident Damian Benitez. "That makes a lot of sense." Benitez says he's glad to learn that there's something a bystander can do that falls in that huge gap between looking the other way, and confronting a harasser head on, which he says he'd be reluctant to do. "Just based on how things are nowadays sometimes you've got to mind your own business," says Benitez. "Because you never know how the other person might retaliate." Another city resident, 60-year-old Robert Powell says he recently found himself in one of those situations, when he says he saw a bunch of kids on a bus harassing a Muslim boy. "You could hear them talking ... 'a n***** sticking up for a sand n*****' ... is how the kid put it," Powell says. Eventually, Powell says, the kids backed off. Some bystanders in an incident in Portland, Oregon recently weren't so lucky when they stood up to a guy allegedly harassing an African American woman and another wearing a hijab. Two of those good Samaritans ended up stabbed to death. "You never know. You never know," says Lecia Brooks, outreach director for the Southern Poverty Law Center. "I would never tell anyone that it's without risk to intervene." Brooks says it'd be useful to add a note of caution to the posters, urging people to first consider safety, and reminding them to call 911 if it looks risky. But Brooks says she applauds the city initiative, and that in most cases people can --and should — intervene. "We take a greater risk when we just let these situations pass, because people then begin to think that it's OK to do so," says Brooks. "We can't allow harassing behavior to become normalized." Yusufi Vali, executive director of the Islamic Society of Boston Cultural Center Mosque, calls the posters "phenomenal." He says his wife was recently harassed at a store, and would have loved if someone had stepped in. "It sends a message to everyone that Muslims are part of Boston," he says. "That they are not the other, that they are just like us, just like any other human being. Some have questioned why the posters focus only on Islamophobic harassment. Ivan Espinoza-Madrigal at the Lawyers' Committee for Civil Rights says he'd like to see a series of posters — so that other minority groups, such as Latinos, or transgender people, don't feel slighted. "The bottom line is that the hate crimes are happening to people from a broad range of communities," he says. "We need to make sure that all of them feel safe and included in this effort as well. City officials say they have no plans right now for different posters, but they say the intervention techniques – illustrated in the Islamophobia poster — can be employed in all kinds of harassment. "It definitely applies across the board," says Sharif. Boston has seen a string of Islamophobic incidents lately, and the city has put up new posters urging bystanders to intervene if they see someone getting harassed. NPR's Tovia Smith reports. TOVIA SMITH, BYLINE: From a distance, it looks like a cute cartoon till you read the bold black headline - what to do if you are witnessing Islamophobic harassment. DIANE SHUFRO: Oh, it's from the city of Boston. SMITH: Fifty-nine-year-old Diane Shufro did a double-take as she passed one of the posters on the side of a bus stop in Boston. It's a kind of giant comic strip showing a young woman watching as a burly guy grimaces at a woman in a long dress and hijab. SHUFRO: It is sign of really frightening times. But at least I see that Boston is encouraging people to be involved. SMITH: Step one, the poster says, ignore the attacker. Don't even make eye contact. Instead, start talking to his target about anything. FAISA SHARIF: Yeah, you can say something about, you know, like, the shoes that someone is wearing or, you know, asking them about the weather or things like that. SMITH: Faisa Sharif with the mayor's office says the posters were designed in France after the terror attacks in 2015 and then went up in San Francisco before Boston. The point, she says, is that even a simple friendly gesture can get an aggressor to back off. SHARIF: This whole campaign is about de-escalation in terms of helping resolve a situation like this and especially in the age that we live in where we see different kind of national rhetoric targeted towards certain groups. DAMIAN BENITEZ: I see. I see what they mean now. That makes a lot of sense. 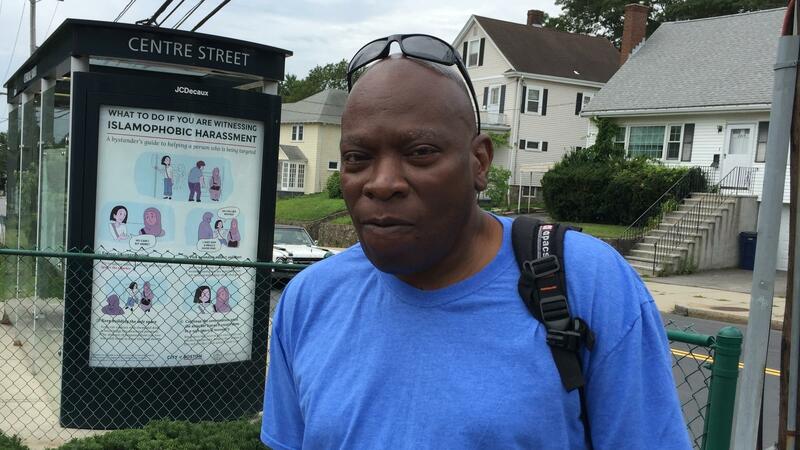 SMITH: Thirty-one-year-old Boston resident Damian Benitez says he's glad to see there's an alternative to confronting a harasser, which he says he'd be reluctant to do. BENITEZ: Just based on how things are nowadays, sometimes you got to kind of mind your own business, you know, 'cause you never know how the other person might retaliate. SMITH: Sixty-year-old Robert Powell says he was in one of those situations when he says a bunch of kids on a bus were harassing a Muslim boy. ROBERT POWELL: It was at a point where I felt that they were getting ready to attack the kid, really. So I did say something, sure. SMITH: Which prompted them to start mouthing off to him. POWELL: You could hear them talking. (Unintelligible) something - a [expletive] sticking up for a sand [expletive], is how the kid put it. SMITH: Powell says the kids eventually backed off. Some bystanders in Portland, Ore., recently weren't so lucky when they stood up to a guy allegedly harassing an African-American woman and another wearing a hijab. Two of those good Samaritans ended up stabbed to death. LECIA BROOKS: You never know. You never know. And so I would never tell anyone that it's without risk to intervene. SMITH: Lecia Brooks from the Southern Poverty Law Center says it'd be useful to add a note of caution to the posters urging people to first consider safety and call 911. But Brooks says in most cases, people can and should intervene. BROOKS: We take a greater risk when we just let these situations pass because people then begin to think that it's OK to do so. We can't allow harassing behavior to become normalized. UNIDENTIFIED MAN: (Praying in Arabic). SMITH: At the Islamic Society of Boston Cultural Center mosque, Executive Director Yusufi Vali calls the posters phenomenal. He says his wife was recently harassed at a store and would have loved if someone had stepped in. YUSUFI VALI: And sent a message to everyone that Muslims are a part of Boston, that they're not the other, you know, that they are just like us, like any other human being. SMITH: Some have questioned why the posters focus only on Muslims. Ivan Espinoza-Madrigal at The Lawyers' Committee for Civil Rights says he'd like to see a series so Latinos or transgender people, for example, don't feel slighted. IVAN ESPINOZA-MADRIGAL: We need to make sure that all of them feel safe and included in this effort as well. SMITH: City officials say they have no plans now for different posters, but they say the intervention techniques illustrated in the Islamophobia poster apply to any kind of harassment. Tovia Smith, NPR News, Boston. Transcript provided by NPR, Copyright NPR.